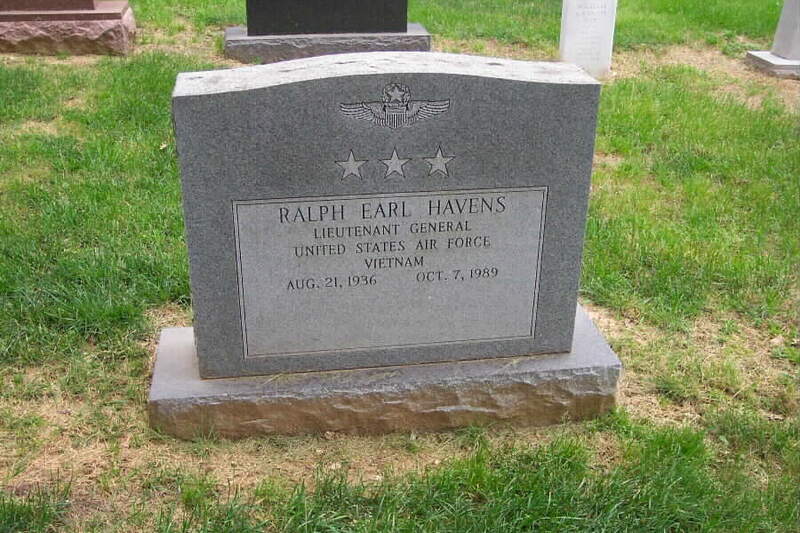 Lieutenant General Ralph E. Havens was commander of Air University with headquarters at Maxwell Air Force Base, Alabama. One of 13 Air Force major commands, Air University is responsible for administering the Air Force's professional military education, continuing education, and graduate education programs which affect, on an annual basis, more than half the service's population. General Havens was born in 1936, in Lincoln, Nebraska, and graduated from George Mason High School, Falls Church, Virginia, in 1955. He received a bachelor of science degree from the University of Virginia in 1960 and a master's degree in business administration from Central Michigan University in 1976. The General completed Squadron Officer School in 1965, U.S. Army Command and General Staff College in 1971, and the National War College in 1976. Upon graduation from the University of Virginia, he was commissioned as a second lieutenant in the Air Force through the Reserve Officer Training Corps program. He received primary and basic pilot training at Graham Air Force Base, Florida, and Laredo Air Force Base, Texas, and completed F-100 combat crew training at Luke Air Force Base, Arizona, in December 1961. The general's first operational assignment was with the 613th Tactical Fighter Squadron, England Air Force Base, Louisiana, in March 1962. While assigned to the 613th, General Havens participated in deployments to Incirlik Air Base, Turkey, and to other overseas locations for rotational alert duty. In August 1963 he joined the 416th Tactical Fighter Squadron at Misawa Air Base, Japan, and in July 1964 returned with the squadron to England Air Force Base. In November 1965 General Havens made his first of three deployments with the 416th to Southeast Asia. He flew his initial F-100 combat mission from Da Nang Air Base, Republic of Vietnam, and completed his Southeast Asia tour of duty with the 3rd Tactical Fighter Wing at Tan Son Nhut and, later, Bien Hoa air bases. He flew more than 200 combat missions with the 3rd Tactical Fighter Wing, the first tactical fighter wing to make a permanent change of station move to the Republic of Vietnam. He returned to Luke Air Force Base in August 1966 as an instructor pilot with the 4510th Tactical Fighter Training Wing and later as flight examiner with the 58th Tactical Fighter Training Wing. Overall, he accumulated more than 2,400 hours in the F-100 before attending intermediate service college. The general graduated from the U.S. Army Command and General Staff College in July 1971 and was assigned to Headquarters U.S. Air Force, Washington, D.C., as an operations staff officer for the deputy chief of staff for programming actions, directly contributing to major Air Force policy decisions concerning the tactical air forces. These actions included aircraft procurement, force distribution and force composition of A-7, F-4, F-15, F-111, F-105G and B-57G units in the United States, Europe and the Pacific. From August 1974 to August 1975 General Havens was assigned to the Office of the Assistant Secretary of Defense for International Security Affairs as assistant for Thailand and the Southeast Asia Treaty Organization, East Asia and Pacific Region. He was primarily involved in the redeployment of U.S. forces and related distribution of assets from Southeast Asia. After completing his master's degree in business administration from Central Michigan University and graduating from the National War College in June 1976, General Havens qualified in F-4s and became the assistant deputy commander for operations, 31st Tactical Fighter Wing, Homestead Air Force Base, Fla. He remained there until March 1979, when he was assigned to the Pentagon as assistant for general officer matters in the Office of the Deputy Chief of Staff for Manpower and Personnel. In May 1983 General Havens became the commander of the 86th Tactical Fighter Wing, Ramstein Air Base, West Germany. During this tour of duty he also served as commander of the 70,000-member Kaiserslautern Military Community, largest American military community outside the continental United States. In June 1985 he became commander of the United States Logistics Group, Ankara Air Station, Turkey. In this position he was the commander of U.S. Air Force personnel in Turkey and responsible for conducting exercises and the logistics support of all United States armed forces in that country. In September 1986 the general was assigned as the assistant deputy chief of staff, personnel for military personnel, Headquarters U.S. Air Force, and commander, Air Force Military Personnel Center, at Randolph Air Force Base, Texas. He assumed his present duties in July 1988. General Havens is a command pilot with more than 3,000 flying hours, accumulated primarily in F-4s, F-16s and F-100s. His military decorations and awards include the Distinguished Service Medal, Legion of Merit with two oak leaf clusters, Distinguished Flying Cross, Meritorious Service Medal, Air Medal with two oak leaf clusters, Air Force Commendation Medal with oak leaf cluster, Presidential Unit Citation with oak leaf cluster, Air Force Outstanding Unit Award with three oak leaf clusters, Combat Readiness Medal, National Defense Service Medal, Armed Forces Expeditionary Medal, Vietnam Service Medal with four service stars, Air Force Longevity Service Award Ribbon with four oak leaf clusters, Small Arms Expert Marksmanship Ribbon, Republic of Vietnam Gallantry Cross with Palm and silver star, and Republic of Vietnam Campaign Medal. He also wears the Parachutist Badge. He was promoted to Lieutenant General August 1, 1988, with the same date of rank. The General is buried in Section 30 of Arlington National Cemetery.